Shiva, "The Auspicious One," is one of the primal controllers of the material world. He is known as the greatest Vaishnava—devotee of Vishnu—and Shiva is Krishna's unique agent for overseeing the mode of ignorance within material creation. He is considered one of the twelve mahajanas, authorities on devotional service to Krishna, and he is in charge of destroying the universe at the time of annihilation. He is the husband of Durga (a.k.a. Maya, Uma, Parvati, Sati, etc. ), Krishna's material energy personified. Shiva is neither an ordinary living entity, jiva, nor a typical demigod. He is in his own category of existence, known as shiva-tattva. He is almost on the level of Vishnu, but because of his interaction with material nature he is not counted as vishnu-tattva, the category of Godhead. - he's the same as and different from Vishnu. - clearing up some misconceptions about the "Hindu trinity"
"Of all the Rudras I am Lord Shiva"
"There are eleven Rudras, of whom Shankara, Lord Shiva, is predominant. He is the incarnation of the Supreme Lord in charge of the mode of ignorance in the universe." 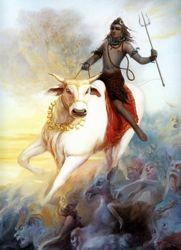 "Lord Shiva is in the marginal position between the Personality of Godhead and the living entities, or jivas. . .Lord Shiva is not an ordinary living being. He is the plenary portion of the Lord, but because Lord Shiva is in direct touch with material nature, he is not exactly in the same transcendental position as Lord Vishnu. The difference is like that between milk and curd. Curd is nothing but milk, and yet it cannot be used in place of milk." "Lord Shiva is the husband of Durga, the controller of the material energy. Durga is personified material energy, and Lord Shiva, being her husband, is the controller of the material energy. He is also the incarnation of the mode of ignorance and one of the three deities representing the Supreme Lord. As His representative, Lord Shiva is identical with the Supreme Personality of Godhead. He is very great, and his renunciation of all material enjoyment is an ideal example of how one should be materially unattached." "Lord Shiva is always in meditation on the lotus feet of Vasudeva, Sri Krishna. Thus the auspicious position of Lord Shiva is realized if one takes to the worship of Vishnu, because Lord Shiva says in the Shiva Purana that the topmost worship is worship of Lord Vishnu. Lord Shiva is worshiped because he is the greatest devotee of Lord Vishnu. One should not, however, make the mistake of considering Lord Shiva and Lord Vishnu to be on the same level. That is also an atheistic idea. It is also enjoined in the Vaishnaviya Purana that Vishnu, or Narayana, is the exalted Supreme Personality of Godhead, and no one should be compared to Him as equal, even Lord Shiva or Lord Brahma, not to speak of other demigods." "Milk changes into yogurt when mixed with a yogurt culture, but actually yogurt is constitutionally nothing but milk. Similarly, Govinda, the Supreme Personality of Godhead, assumes the form of Lord Shiva for the special purpose of material transactions. I offer my obeisances at Lord Govinda's lotus feet"
" . . . by expanding Himself as Lord Shiva, the Supreme Lord is engaged when there is a need to annihilate the universe. Lord Shiva, in association with maya, has many forms, which are generally numbered at eleven. Lord Shiva is not one of the living entities; he is, more or less, Krishna Himself. The example of milk and yogurt is often given in this regard—yogurt is a preparation of milk, but still yogurt cannot be used as milk. Similarly, Lord Shiva is an expansion of Krishna, but he cannot act as Krishna, nor can we derive the spiritual restoration from Lord Shiva that we derive from Krishna. The essential difference is that Lord Shiva has a connection with material nature, but Vishnu or Lord Krishna has nothing to do with material nature. In Srimad-Bhagavatam (10.88.3) it is stated that Lord Shiva is a combination of three kinds of transformed consciousness known as vaikarika, taijasa and tamasa." I thought the universe had many gods—what about Brahma, Vishnu and Shiva? Will I offend Ganesh and Shiva if I exclusively worship Krishna? Who's the Supreme Being, Shiva or Krishna?